The RC15 is a powerful flashlight from Fenix that harnesses a built-in rechargeable Li-ion battery for 860 max lumens from the Cree XM-L U2 LED. The RC15 features an exclusive ZONE CONTROL BEAM, which permits wide-angle visibility with spotlight penetration. The flashlight has both an on/off switch and a side switch selector on the head. The side switch quickly changes the general mode light output level with a push of the button. Pressing the side switch for 1 second turns on the strobe mode. It has an aircraft-grade aluminum body with a Type III hard coat anodized finish. 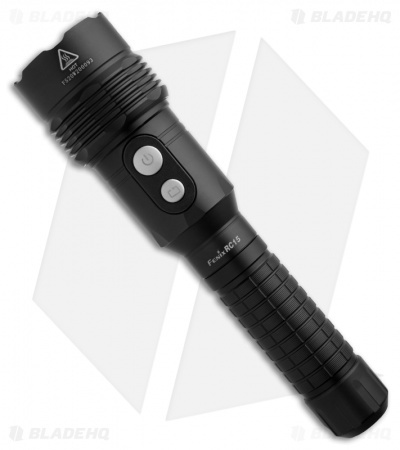 Like other Fenix flashlights the RC15 has an ultra-clear glass lens with an anti-reflective coating, and digitally regulated output for constant brightness. ANSI/NEMA FL1 standards. The RC15 can be charged by an AC charger or a car charger (included).